In order to grow your business, you've to have the speaking engagement and have to get ready to give your presentation. You are not sure what relevant, actionable strategies are going to work with your audience. Accordingly, you don't have to overwhelm and you certainly don't want to underwhelm your audience as well. 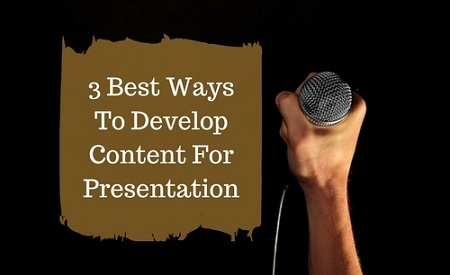 So, here are 3 best ways that you need to consider as you start to develop the content for your presentation. Have a conversation with the meeting planner, the event coordinator or the boss whoever it is that brought you in to teach this workshop. What you need to know from them are the 3 things. What is the current knowledge level of the audience that you're going to be speaking to knowing or how much they already know about the subject? This will help you to determine what you should include in your presentation. How long should be your presentation? You also need to know how long your presentation is. So, if you need to come in and do a 60 to 90-minutes workshop then well, that's different than giving a half-day or full-day presentation. You can obviously get more content into a long day. You have to know is what they want the audience to be able to do based on the information that they learn from you and then you can work backward and develop your content based on what the outcomes are and based on what they should be able to do after they've listened to your presentation. Let's say that you were going to give a social media workshop. Then depending on where your audience is they may need a beginner’s workshop, where you just tell them a little bit information about each platform or if they are an advanced group. Then you may need to be diving deep into algorithms and pixels and retargeting on Facebook. Has this information been shared before? You need to consider as you start to develop your content; is this a recurring event and if so what has already been covered. So, let's say you're speaking at an annual luncheon or an annual x-bar conference. Before going to give your presentation you have to research the previous year's conference and look at the workshop topics, look at some of the experts who they brought in, look at some of the key and the bullet points that they listed on their workshop so that you already know what this audience has probably been exposed to. That way you can look for gaps that you can fill in. Looking back at our social media example let's say you were going to give a presentation on how to grow your business with YouTube. Well, someone may have given that presentation last year but they wouldn't have the new information that came out in January of this year where YouTube creators are now going to be limited in terms of monetization based on how many subscribers they have. So, if you've got something new and fresh to bring to the topic that is ok to repeat some of that same topic from last year as long as you're putting your new spin on it. Again you always have to keep at the forefront of your mind how is my audience going to use this information, what do I want them to be able to do as a result of my presentation. Assume that you're giving a social media workshop to a group of business owners. Some outcomes for them maybe they need to be able to know how to engage with the social media followers and they need to be able to turn likes into paying customers. So, the content that you would develop there would be leading them towards those outcomes. But let's say you were going to give a social media workshop to a corporation who had a small division and they needed their newest staff members trained on social media. Well, they may be using social media as a customer service portal for their business. So, they would need to understand how to navigate complaints and customer questions based on the platform that they're using. After you've given this presentation is there an opportunity for you to come back into the organization and help them to implement what they've learned. If there is an opportunity for you to help them implement then you want to make sure your talk is laid out in a way that it is still providing relevant, valuable content but that is also showcasing your expertise so that if they bring someone in to help them implement the obvious first choice would be you. If you're giving the social media workshop and you let them know in order to turn likes into customers then you have to dedicate at least 30 to 35 hours a week to update your social media, developing content and engaging with your fans and followers. But then the people in the room are like whoa! We already are overworked and we certainly don't have another 35 hours on the week to dedicate to this what options do we have then? That's when you get to speak up and say well actually you should outsource it because this is so critical to the growth of your company it's not something that you can push to the side. You can also hire a company to help you implement the strategies that I've read today. Now there's different kind of approaches based on who you're speaking to. If you're speaking to a roomful of decision-makers, for example like our business owners. Then they're in the position to say, what we'd like to bring you on as our social media manager. However, if you're speaking to a roomful of staff members who really don't have any decision-making power. Then what you have to do is set up a debriefing of your training with the person who hired. You should sit down with them sometime after your presentation and just do a debriefing, say based on what you shared with the group, based on the feedback that you got. You're going to interview the person who's bringing you in to speak so that you get an understanding of the knowledge level of your audience. You're going to research any past events or speakers who they've brought in to speak on similar topics. You also want to determine what opportunities may exist because you don't have to give them everything if there's a possibility that you could help them implement some of what you're teaching.